1816 Testimonies title page. Click to enlarge. Shaker religion began with the early Believers in England who converted to this new Protestant Christian sect from several other religious traditions and groups, including the Quakers, the Methodists, and a charismatic, mystical group known as the Camisards (or French Prophets). After their emigration to America in 1774, the Shakers attracted converts from numerous other Protestant groups, including the New Light Baptists, Presbyterians, and others sprinkled throughout the land in the aftermath of The Great Awakening of the 1740s. The tumultuous early days of the Shakers in America were well documented in one of their first printed works, commonly called the Testimonies. 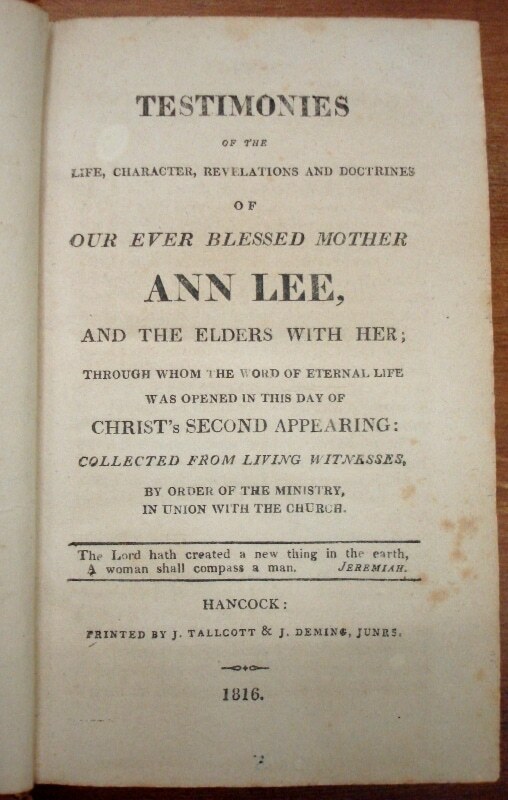 Printed at Hancock in 1816, the testimonies asked older believers to recall their first meetings with Mother Ann Lee, and their subsequent conversions to the new faith she espoused. 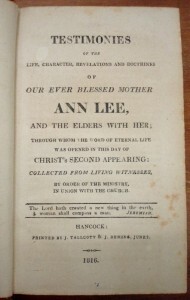 Following is a sample of testimonies from the early Shakers at Hancock. The Shakers’ mission was to live a perfect Christian life as portrayed in the Gospels and in the early Christian communities. The Shakers based their religion and their lives on celibacy, communal living, and the confession of sin. They attempted to attain spiritual and temporal simplicity, pacifism and perfection in all aspects of their lives. Those outside the faith, called “World’s People” by Believers, who referred to them as Shakers due to the whirling and shaking and other ecstatic movements that would sometimes overcome the Believers during worship. Dancing was a key expression of Shaker spirituality, and was often described as a spiritual and physical means through which the Believers could shake off their sins. The Shakers were not alone in the use of dance as a mode of worship, as many of the other world’s religions incorporate the practice of dance into their rituals. Christians, Jews, Muslims and Hindus all write of dance in their sacred texts or practice it during worship. A short video of HSV staff demonstrating selected Shaker songs and dances. The Shakers’ quest was to create a working Heaven on Earth during what they believed to be the time of the second reign of the Christ spirit, as foretold in the Bible and in basic Christian millennial philosophy. Their official name is the United Society of Believers in Christ’s Second Appearing. Click here to read the Basic Principles and Beliefs of the Shakers, as expressed by the active Shaker community in Sabbathday Lake, Maine.